There are several ways to connect with Eagle Rock Jr./Sr. High PTSA in order to get updates, news and information. Email: We may be contacted via email. Please go to the Contact page to send an email to one of our board members, or send an email to info@eaglerockhsptsa.org. Members will also be receiving email updates on a regular basis. To sign up for the email, click on info@eaglerockhsptsa.org. and request to be added to the email list, or click on Subscribe. Facebook: Our Facebook page is Eagle Rock High School PTSA. To join the PTSA group, If you have a smartphone, get push notifications. On your iPhone or Android phone, open your web browser and go to the following link: rmd.at/h24d4k. 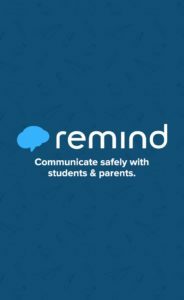 Follow the instructions to sign up for Remind. You’ll be prompted to download the mobile app. To join the Senior Class of 2019, If you have a smartphone, get push notifications. On your iPhone or Android phone, open your web browser and go to the following link: rmd.at/e2d9fek. Follow the instructions to sign up for Remind. You’ll be prompted to download the mobile app.